Now that I'm older (I say that, but I'm still only in my early twenties - but hey, it's better than the ignorance and obliviousness of being 17), I'm more confident with my clothing choices. I think we all get better at dressing ourselves as we get older really, but I've noticed that, as I began to stop caring what people thought, I started dressing in tandem with my personality and mood rather than adapting my looks to suit other people's preferences. Around two years ago, all I wore was black and grey. I wore clothes like this because I didn't really want people to notice me, and because all the people I followed on Instagram wore black and grey. Now, it doesn't cross my mind whether people notice me or not, and I still follow people who dress in monochrome, but I've learned to break away from that negative mindset and follow my own sartorial path. Yes, I still wear black - it is, and will always be, slimming - but now, when I go shopping, I'm drawn to bright colours and bold prints. 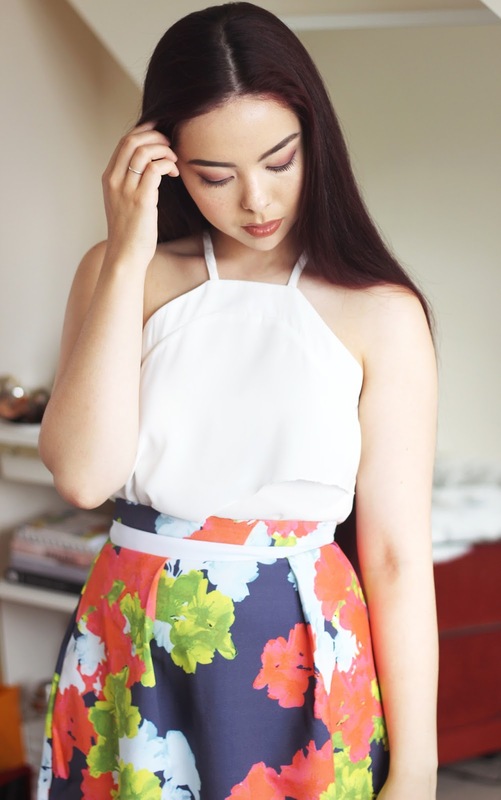 This outfit from Vesper247 is unbelievably gorgeous for summer (when we eventually get some good weather). 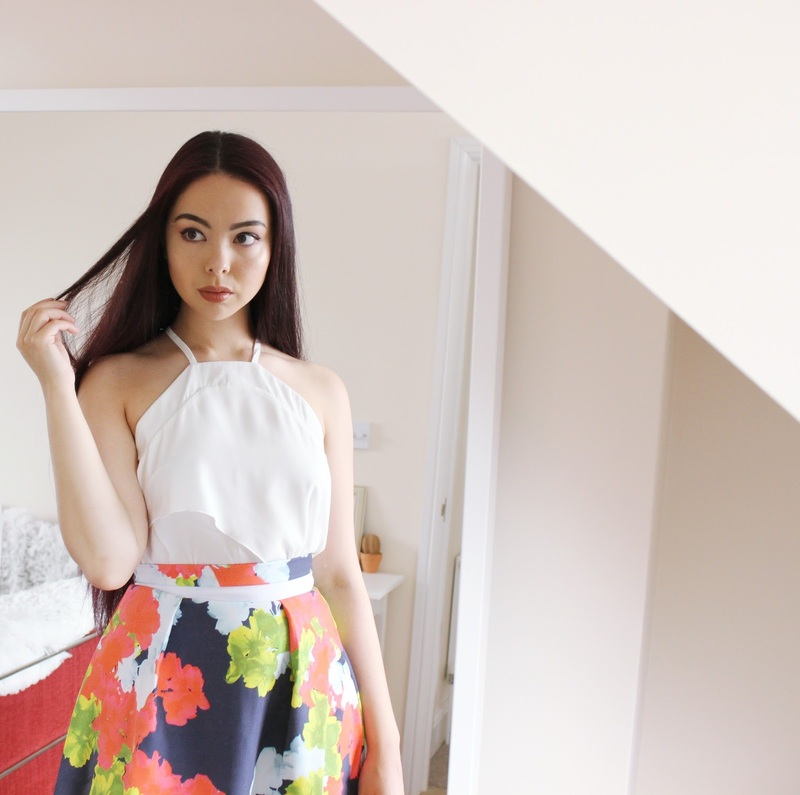 The floral print on the skirt* is pretty and eye catching without being too 'girly' and the white ruffle cami top* looks delicate and soft against the bold print. I love the silhouette; clothing that cinches me in at the waist is my go-to, as I love the fact that I have curvier hips and a smaller waist (without sounding like I'm bragging - we should all embrace our fabulous figures!). Most of all, I'm seriously impressed with the quality of this outfit. The material of the skirt is sturdy and heavier than average - so there won't be any chance of an accident on a windy day (oh yes, I've been there) - and the zips on both pieces are firm and well sewn in. I do have to add in that this outfit is perfect for wedding season, which is firmly upon us. 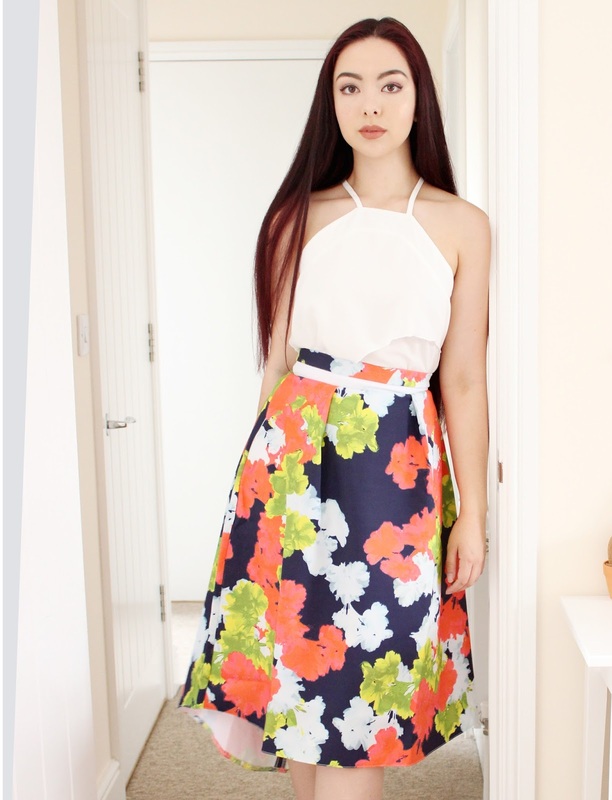 After wearing a maxi dress to a wedding last year in 30 degree heat, I wish I had something like this outfit to keep me cool but still looking elegant and stylish. In fact, Vesper 247 has a great selection of pieces ideal for weddings and other events. I wore this to a baby shower and got so many compliments from a range of women with different tastes and style preferences. Versper247's SS16 range has so many choices for those who love pastels and florals, as well as those who are more drawn to block colours and graphic prints. Prices start from around £15 in sale, £29 in new. Visit the website here. The UK's Answer to Sephora? Kat Von D Beauty is Launching in the UK!